Hello Mother Nature, goodbye dry skin!! 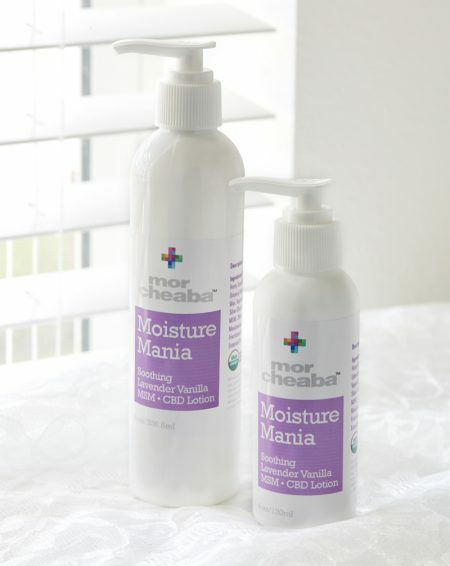 Ultra soothing Moisture Mania MSM CBD lotion for the entire body. We’ve put a lot of time and research into our latest skincare product, Morcheaba Day Cream for the body. Retain moisture and rejuvenate while adding protection from the elements! Divine hints of vanilla and lavender. MSM is known for its effects with anti-aging, anti-inflammatory, pain relief and the penetration enhancement of active ingredients. Natural moisturizing from aloe vera, vitamin E and C, omega oils, ginseng, manuka honey, coconut oil, full spectrum hemp extracts, and the amazing effects of 100% pure Frangipani oil. Available in two sizes, 4oz. with 125mg CBD and 8oz with 250mg CBD. Ingredients: Organic Rose Hydrosol, Water, Hemp Seed Oil – (Unrefined), Shea Butter, Aloe Vera, Ginseng Extract, Natural Vegetable Emulsifying Wax, Vegetable Stearic Acid, Vegetable Glycerin, Silver Dihydrogen Citrate, L-Ascorbic Acid (Organic Vitamin C), Manuka Honey UMF16, MSM, Full Spectrum CBD Hemp Extract, Meadow foam Oil (Organic Vitamin E), Organic MCT Fractionated Coconut oil, Lavender and Vanilla Essential Oils.